This is a natural bristle dry brush system. 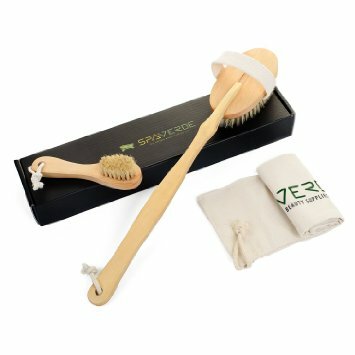 The set comes with the body brush that has a strap handle and a detachable long handle for the hard to reach areas. Also there is a bonus face brush included, and a carrying bag. Dry brushing your skin helps to reduce cellulite, prevent stretch marks, improve your circulation, close your pores, and relieve stress and muscle tension. Before your shower is the best time to brush your skin. Personally I like to shower in the morning, but morning or evening is good, both is even better.When dry brushing you should always start at the toes and work upward toward the heart. 5 to 10 strokes in each area in about 6 inch strokes, using gentle to moderate pressure. Your skin should turn pink, not red. You should pay special attention in the arm pit and inner thigh areas, as these areas are lymphatic drain areas. The face brush is smaller and also has natural bristles. You should use it in the same way as the body brush, a gentle sweeping motion rather than a scrubbing motion, again skin should turn pink , not red. If it does turn red be a little more gentle next time. The first few times you dry brush your skin it might feel a little tingly or itchy afterward but by the 4th time it should be a pleasant relaxing experience. Personally I love it, my skin feels and looks better and it is really relaxing to me. I received this product for free and was compensated for an honest unbiased review.